This web portal is respectfully dedicated to Shri Sukh Lal Jain, father of Shri Prakash Lall Jain, in memory of his lofty ideals of equanimity, amity, fidelity and liberation, modest efforts have been made to prepare and present this programme for world wide hosting. Shri Sukh Lal was a true devotee and aspirant of Lord Mahavir, striving to follow strictly the religious principles laid down by Him. 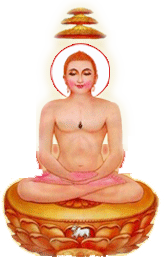 Apart from the worldly chores which could not be ignored, he devoted his entire life to serve the humanity through promotion of principles of Jainism, which, according to him, applied to one and all. जूझता है सूर्य नहीं, जुझते हैं दिपक! We pray that he may keep on showing the light from his abode enabling us to fulfil his wishes.